The Neater UNi-Chair wheelchair is a chair specifically designed for those who suffer from hemiplegia (paralysis to one side of the body). Manual wheelchairs are normally designed to be propelled and steered by the use of both arms and hands and work very well for those who are able to use both arms. 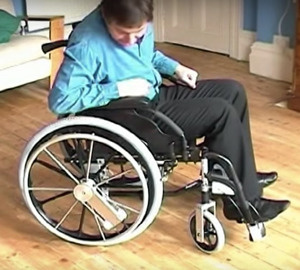 The Neater Uni-Chair is propelled using one arm and is steered using one foot. 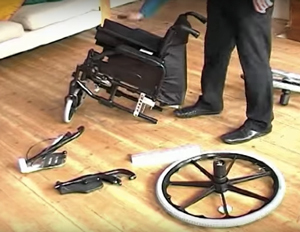 For those who are affected by hemiplegia, manual wheelchairs are are often adapted for one arm use by adding one arm drive mechanism that allows propulsion and steering by the use of a single arm. Some one arm drive systems incorporate a double hand rim on one side that allows the user to drive both wheels by gripping the two rims or steering by turning only one hand rim. Another type of one arm drive is the lever drive that uses a lever connected to a rear wheel to move the chair and turned to steer the chair. Both of these types of one arm drives are options added to the basic wheelchair at time of purchase or added afterward. 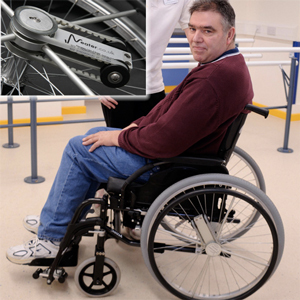 The Neater Uni-Chair user uses one arm to propel the wheelchair using a hand rim that is connected to both wheels by means of a special differential that allows the wheels to turn at different rates when needed and one foot that steers the chair using a footplate on the footrest. When the foot turns the turning footplate the front caster turns in the direction the user designates and the wheelchair follows. Users who only have the use of one arm and one foot can achieve independent mobility. 12 Burlington Rd, Buxton SK17 9AL, UK.